The Taste of Madison Organizing Committee is pleased to announce that the 18th annual Taste of Madison will be held on Monday, March 18, 2019, just one day after Saint Patrick’s Day. Brooklake Country Club, of 139 Brooklake Road in Florham Park, will be the venue for the Taste for the second time in a row, organizers said. Chefs from thirty of Madison’s best restaurants will graciously serve samples of their best dishes on March 18. Gary’s Wine & Marketplace, the event’s longtime presenting sponsor, will provide Taste guests with fine wine, beer and spirits, as will other local merchants. Always held in the first quarter of the year, the Taste of Madison was established in 2002 as a fun, town wide fundraiser and a cure for the winter blues. In its previous seventeen editions, the Taste of Madison has raised more than $550,000 and entertained more than 7,500 guests. The Taste of Madison Organizing Committee is a volunteer, non-profit partnership between the Madison Area Chamber of Commerce, the Madison Downtown Development Commission and the Rotary Club of Madison. Taste proceeds fund charitable causes, civic improvements and business development in Madison. The co-chairs of the 2018 Taste of Madison are Michael Pellessier (DDC), Karen Giambra (Chamber) and David Morozoff (Rotary). 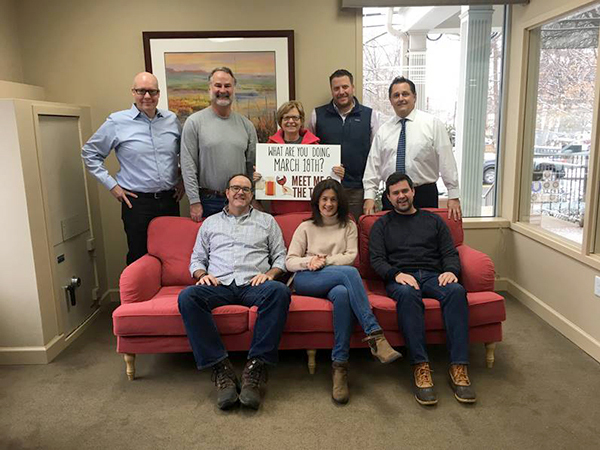 Members of the organizing committee are Madison Mayor Bob Conley, Lisa Ellis, Jim Hollenbach, Rocco Iossa, John Morris, Michael Odell and Anna Riker. Dave Thompson is the Gary’s Wine & Marketplace representative to the committee. For information about Taste corporate sponsorships and advertising opportunities, contact Karen Giambra at madisonchamber@gmail.com and 973-214-7014. Or contact Michael Pellessier at mpellessier93@gmail.com and 360-581-2910. Taste of Madison’s silent auction and tricky tray events are some of the best in northern New Jersey. The businesses of Madison and the friends of Madison donate merchandise and services to the cause. Donations are welcome anytime. The Taste also offers a 50/50 raffle drawing during the night of the event. Starting in February, visit Gary’s Wine & Marketplace in Madison or TasteOfMadison.org for tickets, which must be purchased in advance due to state regulations. Taste guests must be 21 years older and the dress code is business casual. VIP Admission (early entry at 6 p.m.) is $100 each. General Admission (entry at 7 p.m.) is $65.00 each. The events ends at 9:30 p.m.
(above) Top row: John Morris, Madison Mayor Bob Conley, Anna Riker, Dave Thompson and Taste Co-Chair David Morozoff. Bottom row: Michael Odell, Taste Co-Chair Karen Giambra, Taste Co-Chair Michael Pellessier. Missing from photo: Lisa Ellis, Jim Hollenbach and Rocco Iossa.